When two people praise your potential buy in a second hand store, its a sure sale, right? Last week, I spot a faux leather vest in Salvos, try it on with the door of the changing room open, to keep an eye on Jnr RF whilst he peruses the toy 'department'. 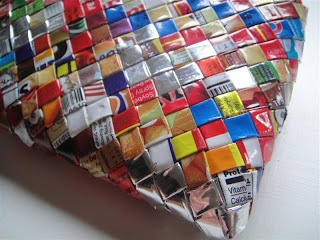 A fellow op shopper walks by, and commends my find "Oh I like that, it looks great". Oh good, I think to myself, and head to the counter. The volunteer assistant serving behind the sales desk compliments my buy too "That's a great little vest, its very cute" Chuffed with myself, I walk away with a 'new' $6 leatherette sleeveless jacket. One wonders, if thrift store, charity shop and opportunity shop staff were to hover around the changing rooms, and compliment potential customer finds all day, they'll be sure to increase sales! I'm wearing my vest today, with a refashioned $1 garage sale skirt made in Pakistan, and a pair of red flats, also from Salvos. 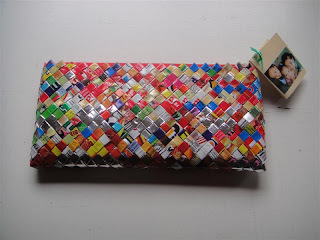 The clutch bag I am holding, is made from recycled chip packets, and is on its way to Alice Shel (together with a zipper brooch), for coming third place in the Brag Your Best Buys contest. Outfit shared with Visible Monday, on the awesomeness that is: Not Dead Yet Style blog. It is a super super cute vest, n the skirt refashion is very summery :) score! My bestie just started volunteering at the Mental Health Fellowship op-shop in Kew Eat. I asked her if she did the same thing - the traditional clothing store spiel. Truth be known though, it would make me not want to go. The lack of push-selling is a draw card - one of many - of the op-shop in my opinion. That is a fair point Charlie! What a great find, and at a good deal too. I don't think I've ever found something at such a good price over at the thrift stores here. A great looking ensemble you've put together. 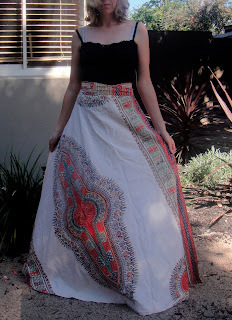 Amazing how good that maxi skirt looks once it's cut down to size. 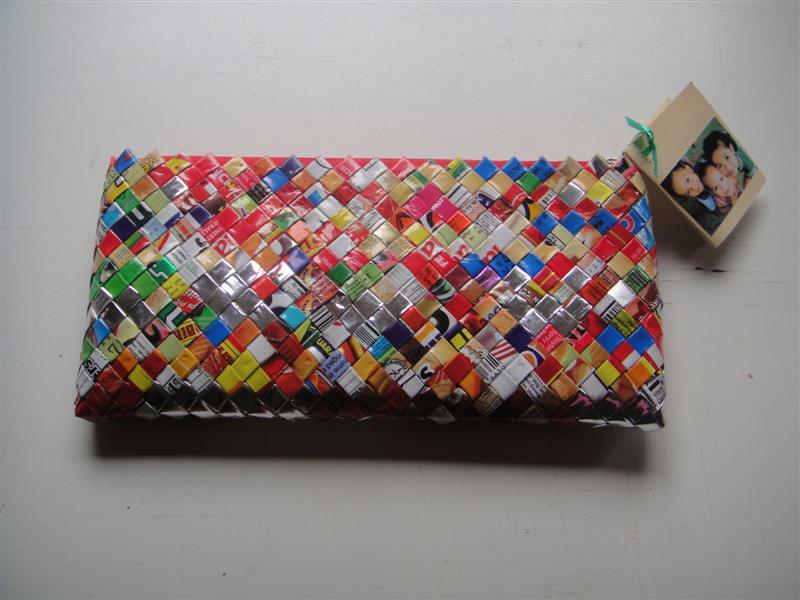 And your woven chip bag clutch is gorgeous. Your skirt turned out amazing! That's a great leatherette vest, too! Such a great vest and skirt upcycle! Pure Awesomenessss! Looks great on you. Love the skirt refashion and the top does seem perfect for you. very cool find - you look great - love the pairing!